SINGAPORE (April 12, 2013) – GLORY, the world’s premier kickboxing league, today announced the quarterfinal stage matchups for its highly-anticipated, one-night, eight-man featherweight (65 kilograms/143 pounds) ‘Slam’ tournament that will headline the GLORY 8 Tokyo mega-event at Ariake Coliseum on Friday, May 3. Additionally, a heavyweight Superfight rematch between powerhouse and all-time great Jerome Le Banner (73-21-2, 59 KOs) of France and Muay Thai champion Koichi (26-8-1, 15 KOs) of Japan was announced for the GLORY 8 Tokyo event. The second meeting between the pair follows their action-packed first encounter in Tokyo on New Year’s Eve when Le Banner stopped Koichi with a blistering right hook with just 13 seconds remaining in the third and final scheduled round of the matchup. The 40-year-old Le Banner, who has faced and defeated nearly every major rival of his generation, including legends Ernesto Hoost and Peter Aerts, stalked and punished Koichi with punch combinations and body kicks during their initial meeting, but Koichi’s iron chin helped him stay on his feet, retaliate and dish out leg kicks that badly damaged the lead thigh of Le Banner and slowed the Frenchman down before Le Banner connected with the finishing blow. In one bracket of the GLORY 8 Tokyo featherweight tournament, world Muay Thai champion Mosab “The Jaguar” Amrani (48-7-4, 14 KOs) of Holland will square off with aggressive-minded Marcus Vinicius (7-1, 1 KO) of Brazil and KO artist Liam Harrison (72-15-2, 38 KOs) of England will face Road To GLORY Japan tournament champion Masaaki Noiri (18-3, 7 KOs) of Japan. In the other tournament bracket, three-time French kickboxing champion Abdallah Ezbiri (32-6, 11 KOs) of Morocco via France will meet two-time kickboxing champion Gabriel Varga (21-1, 8 KOs) of Canada and two-time, eight-man kickboxing tournament winner Yuta Kubo (37-4-1, 17 KOs) of Japan will battle hard-hitting Lim Chi Bin (69-16, 40 KOs) of South Korea. The winner of the quarterfinal stage bout between Amrani and Vinicius will face the winner of the quarterfinal stage fight between Harrison and Noiri while the victor of the quarterfinal stage contest between Ezbiri and Varga will square off with the winner of the bout between Kubo and Lim. The two winners of the semifinal stage fights will face off in the championship stage of the tournament with a $100,000 grand prize at stake. is the opportunity I’ve dreamed of. “I’m very happy and honored to become a GLORY fighter. This is the top of (Mount) Everest – the best event in the world! “I’ve been French, European and, now world champion and I had the pleasure of fighting in Japan already and to fight a great tournament, step by step. Now I have (the opportunity) to fight for GLORY, the biggest promotion, and in the greatest tournament ever at 65 kilograms! “I am very excited about being in this tournament. I am considering it the opportunity of my life and the crucial step to becoming No. 1 in the world. I am getting prepared to achieve this. “I am really proud to be a part of the featherweight tournament in GLORY. Based on that pride, I will fight as well as possible and put on a good performance. 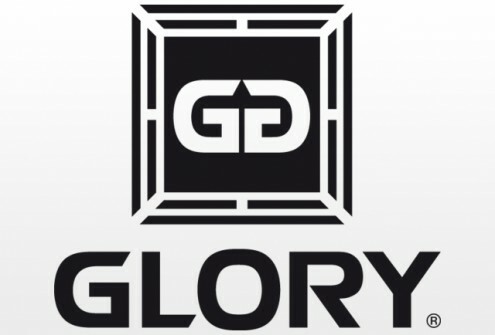 Tickets for GLORY 8 Tokyo, beginning at 16:00 at Ariake Coliseum on Friday, May 3, are priced from ¥5,000, and can be purchased online at Pia (http://pia.jp/t/), E-Plus (http://eplus.jp) and Lawson Ticket (http:l-tike.com). In other GLORY 8 Tokyo Superfight action, legendary heavyweight champion Peter Aerts (102-30-1, 77 KOs) of The Netherlands will collide with fast-rising star Jamal Ben Saddik (24-2, 20 KOs) of Belgium. A lightweight (70 kilograms/154 pounds) Superfight will pit prolific superstars Andy Ristie (36-3-1, 18 KOs) of Suriname and Albert “The Hurricane” Kraus (75-15-3, 45 KOs) of The Netherlands against one another. 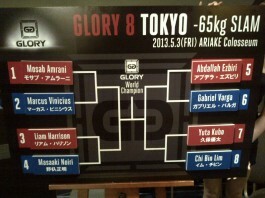 This entry was posted in Events, Features, News & Results and tagged featured, Glory Tokyo, kickboxing, Muay Thai. Bookmark the permalink.